On January 2013, at the invitation of Democratic Involvement Center (N240, Rustaveli Street, Sagaredjo) a Meeting-Dialogue was arranged on the topic “Eco-Clubs Role in Environmental Awareness Raising” in the city of Sagaredjo. Representatives of public schools Eco-clubs from Sagaredjo, village Patardzeuli and village Tskarostavi participated in the Meeting. 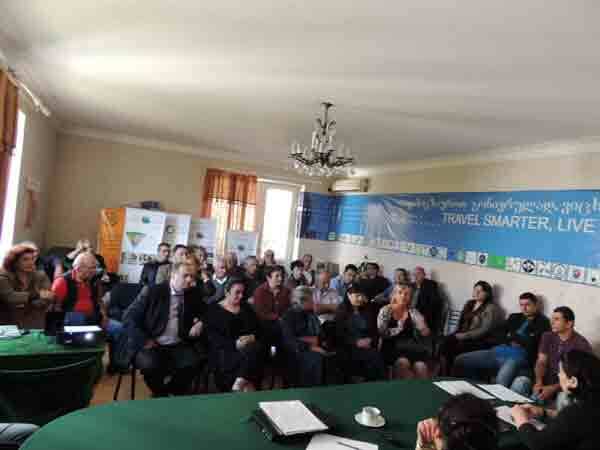 On 30 November 2012 at the invitation of Community Fund “Egrisi” and in the framework of the project “Clean-up Georgia – Public Awareness Raising and its Involvement in the Improvement of the Process of Solid Wastes Management” was held a meetin. 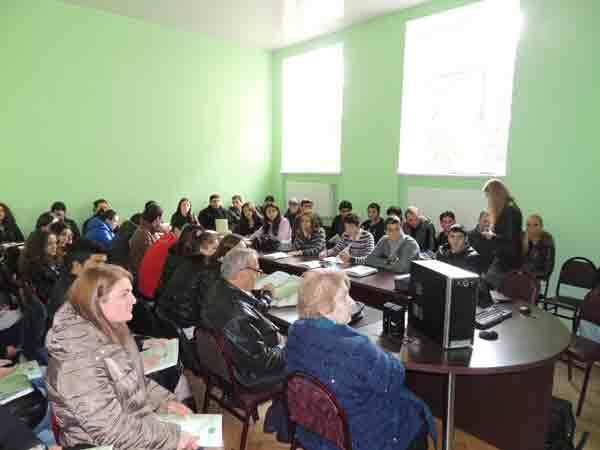 The topic of the Meeting was sustainable management of wastes and it was held for VIII-XII grades schoolchildren of the village of Orsantia’s Public School of Zugdidi Municipality. At the Meeting the schoolchildren were provided complete information about the newest technologies and the best practice existing in the world in the field of waste management. Also discussions were held concerning the waste problems at schools. 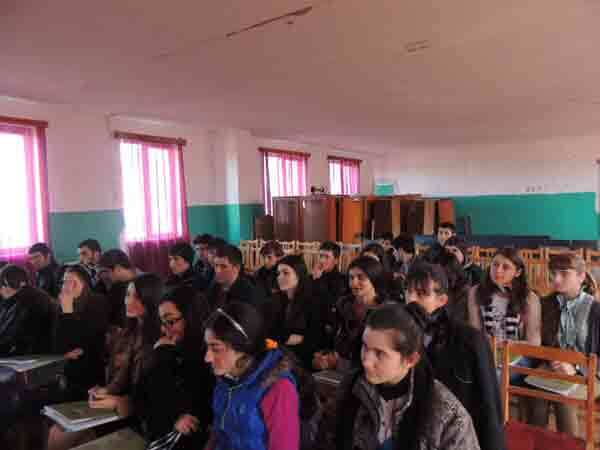 On 20 November 2012 in the framework of the project “Clean-up Georgia – Public Awareness Raising and its Involvement in the Improvement of the Process of Solid Wastes Management” was held a Seminar on the Sustainable Management of Wastes for the students of the Gori Sukhishvili Educational University. At the meeting the students were provided full information about the newest technologies and the best practice existing in the world in the field of waste management. 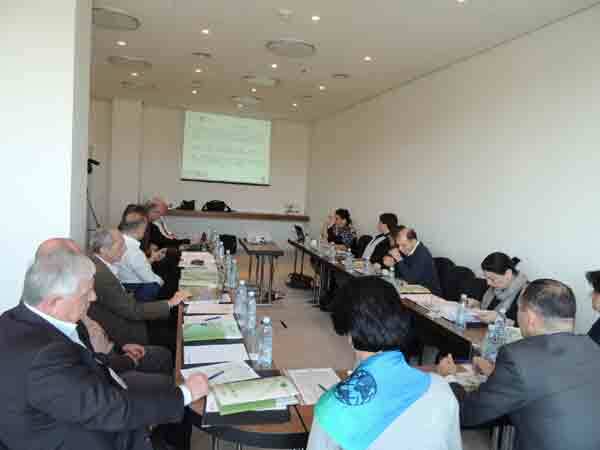 Also discussions were held concerning the problems connected with the wastes and other environmental issues. 2012-11-17 National Meeting of the Project "Cleanup Georgia"
On November 16, 2012 in the framework of the project “Clean-up Georgia – Public Awareness Raising and Its Involvement in the Process of Improvement of Wastes Management” a Reporting Meeting was held at Tbilisi Marriot Hotel. Participants of the Meeting were the Project implementation group members, regional coordinators, experts, representatives of the Swedish Embassy and the Ministry of Environment Protection, also organizational groups of the carried out activities within the Project framework (students, schoolchildren and interested citizens). 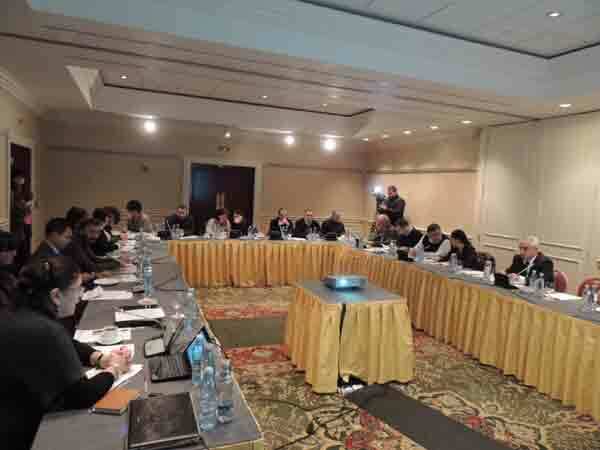 On November 15, 2012 at Tbilisi Marriott Hotel a Conference “The Role of Recycling Business and Main Challenges in the Integrated Solid Wastes Management” was held in the framework of the project “Clean-up Georgia – Public Awareness Raising and Its Involvement in the Process of Improvement of Wastes Management”. 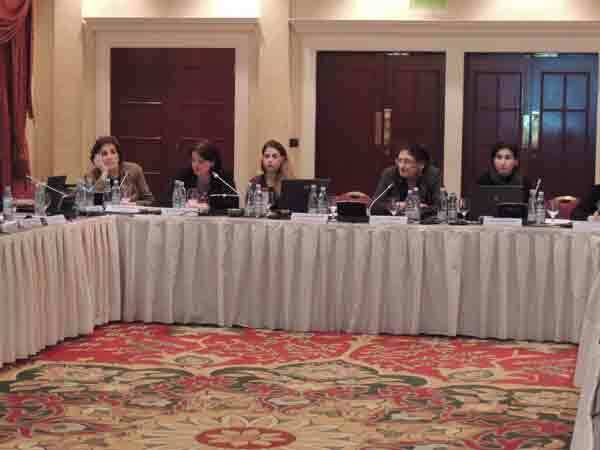 The Conference was attended by the representatives of governmental and non-governmental structures, business-organizations involved in the solid municipal wastes recycling/treatment, Ms. Khatuna Zaldastanishvili, SIDA programs Officer in Georgia, Ms. Elina Velinova, Resident Twinning Adviser, foreign Consultant of the Project Strengthening the Capacities of the Ministry of Environment and Natural Resources in Development and Improvement of Waste Management System in Georgia. 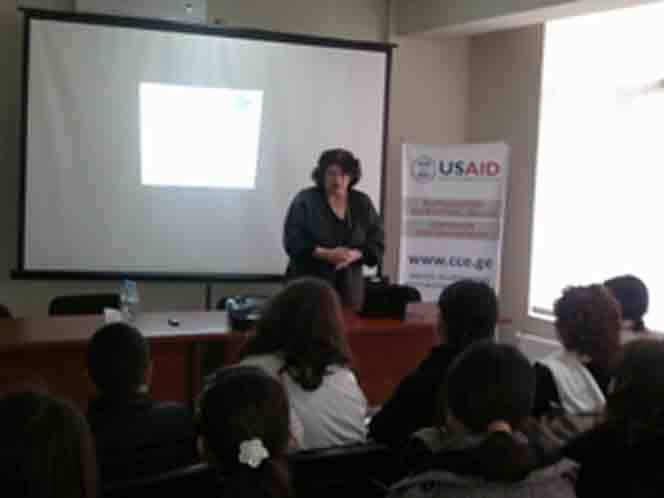 On November 3, 2012 at the invitation of “Tedzami”, a Women Community Organization, a Seminar was arranged on sustainable management of wastes for the students of public schools in the village of Akhalkalaki of Kaspi Municipality in the framework of the project “Clean-up Georgia – Public Awareness Raising and Its Involvement in the Process of Improvement of Wastes Management”. At the Seminar the students were provided complete information about the modern technologies and best practices existing in the world in the field of sustainable management of wastes. The schoolchildren showed big interest towards the Meeting. They got comprehensive answers to all their questions. They were provided booklets on solid wastes separation, recycling and composting published in the framework of the project. 2012-10-31 October 31 – Black Sea Protection Day! On 31 October 1996 Environmental Ministers of the Black Sea six countries (Georgia, Romania, Ukraine, Bulgaria, Russian federation and Turkey) signed the Strategic Action Plan for the Protection and Rehabilitation of the Black Sea. The Strategic Action Plan defined those necessary measures that would significantly facilitate to monitoring, living resources management, sustainable development and the reduction of the Black Sea pollution. 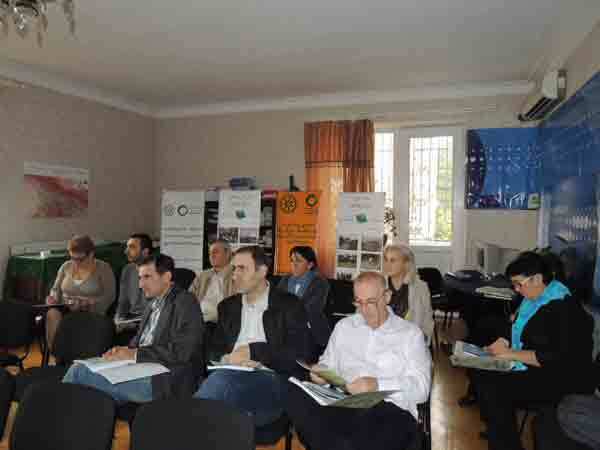 On October 27, 2012 in the framework of the project “Clean-up Georgia – Public Awareness Raising and Its Involvement in the Process of Improvement of Wastes Management” a meeting on the issues of sustainable management of wastes was arranged with the government representatives of Abkhazian Autonomous Republic Environmental Department. At the Meeting complete information was provided about the modern technologies and best practices existing in the world in the field of sustainable management of wastes. In addition, discussions were arranged with regard to other problems connected with the wastes and other environmental issues. On October 26, 2012 at Tbilisi Radisson Hotel a Coordinating and Information Providing Meeting on Solid Wastes Management Issues in Georgia was held in the framework of the project “Clean-up Georgia – Public Awareness Raising and Its Involvement in the Process of Improvement of Wastes Management”. The purpose of the Meeting was to briefly review information on ongoing projects and current activities in the field of wastes management in Georgia, to share the accumulated experience, identify the achievements and existing problems, and establish the mechanisms of cooperation in order to prevent the planning of identical activities. On 18 September 2012 a summarizing action of the campaign “Cleanup World – Cleanup Georgia” – painting on the wall with the campaign logo (at Varaziskhevi and Chavchavadze Avenue junction) was arranged. Ambassador Extraordinary and Plenipotentiary of the Kingdom of Sweden to Georgia, Diana Janse and Ms. Khatuna Zaldastanishvili, Program Officer of the Embassy in Georgia participated in the event. 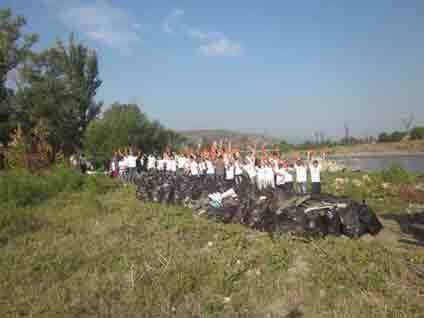 On 13-14 October a cleanup action was held in Lagodekhi Reserve in the framework of “Clean-up Georgia” campaign dedicated to 100 year anniversary of the Reserve. 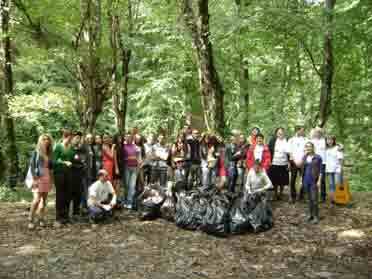 A clean up action was carried out in the Reserve and its adjacent territory. A group on the students of Ilia University and I. Javakhishvili State University, models of Model Agency Fame Agency, Sweco Environment AB waste management experts in Georgia Ingrid Hastad and Martijn van Praagh and local population participated in the action. Many people from the local municipalities and councils (Sakrebulo) participated at the action. The final action of the event “Wall Painting” (campaign logo will be illustrated on walls) will take place on September 18th, 11:30, next to the crossroad of Chavchavadze and Varaziskhevi avenues (in front of University building). The Ambassador of the Kingdom of Sweden in Georgia, Extraordinary and Plenipotentiary: H.E. Mrs. Diana Janse and other representative of the embassy will be participating in wall painting action. Mayor of Tbilisi Mr. Gigi Ugulava is also invited to participate. The project “Clean up Georgia - Raising of Public Awareness and Involvement in Solid Waste Management Improvement” is being implemented by the NGO consortium – the Greens Movement/Friends of the Earth – Georgia and Sustainable Development Union EcoVision, with the financial support of the Swedish International Development Agency (Sida) and facilitation of the Ministry of Environment Protection. On September 14-15-16 in many countries worldwide an annual clean-up international campaign “Clean Up the World” was conducted, which was established in 1992 at the initiative of UNEP. The Campaign is held every September and it hosts up to 130 countries.